If you’re a parent reading this, we suspect your kids have seen your pricey camera drone in action and are desperate to fly it themselves. Quite rightly, you’re probably nervous about handing over the controls of your pride and joy to a minor. Lucky for you, the best drones for kids offer plenty of great features, but in smaller, more affordable and, most importantly, safer-to-fly packages. Kids drones are some of the cheapest on the market and as such only focus on a few key features - as opposed to the bells and whistles of more top-end models such as the Parrot Anafi or DJI Mavic Air - but this makes them ideal for first-time flyers. In this guide we’ll walk you through what the best drones for kids offer in terms of features, performance and safety, so you can make the right choice for your child. When first learning to pilot a drone, your kid’s needs will be basic. That said, there are a few essentials that can really help novice pilots: built-in stabilisation is great for steadier flights and greater flying confidence, and single button take-off and landing takes care of two tricky manoeuvres. Many drones at this level also feature Altitude Hold mode, which keeps the drone in the air even if you release the controls. You’ll find the best balance of features and performance with the Altair AA108. The drone delivers plenty of features to help beginners develop, including three flight skill levels and the aforementioned Altitude Hold mode. The 720p wide angle camera up front means kids can start developing their aerial photography skills, too. Not all drones for kids are created equal, so it’s wise to consider a few key points before buying one. For starters, will your child be flying their drone outdoors as well as at home? If so, you’ll need something a little bigger, more powerful and more stable so playtime doesn’t end prematurely due to a gust of wind. Other great features to consider investing in are Altitude Hold mode, designed to keep the drone airborne without controller input, auto landing and take-off functions and gyroscopic stabilisation. Some of the best drones for kids are designed for more than just flying. Take a look at the stunt-tastic JoyGeek Mini Drone, for example, or the laser-equipped Holy Stone HS177 battle drone — a great bit of added entertainment to keep the kids occupied. The more you spend, the more additional features you’ll unlock, such as an on-board camera, the ability to beam a first-person camera view to your smartphone, and crash-proof construction. There are hundreds of kids drones to to choose from, but the brands we’ve selected in this guide, such as Hubsan, UDI and Holy Stone, have a solid reputation in terms of performance, reliability and build quality. If your child has been looking at your full-sized drone with rapacious eyes, but you’re apprehensive about letting them loose on such a powerful machine, the AA108 packs top-end styling but with enough features to ensure it’s a safe and fun drone for learning the piloting basics. No wonder it’s our top pick for the best drone for kids. One touch take-off and landing takes the stress out of getting airborne, and Headless and Altitude Hold modes mean the drone won’t drop out of the sky or unwittingly fly out of range; Fixed propeller guards are on hand to protect people and surroundings. The AA108 is a drone to progress with, too: the FlyingSee companion app introduces new pilots to custom flight paths - send the drone automatically along a specific route traced on your smartphone screen - and the 120 degree wide angle 720p camera is a great starting point for developing aerial photography skills. With its three modes, beginners can learn well within their means. Mode 1 provides maximum stability while they learn the ropes. They can advance to Mode 2 for medium speed and Mode 3 for all its tricks, bells and whistles. Headless Mode, which is actually a help, not a hindrance, means no adjustment to the aircraft is required before flying, making it even easier for beginners to grasp the basics. Add the fact that it’s got cool flashy lights and you have yourself a massive hit. The Joygeek Mini Drone is one of the smallest and toughest UAVs on this list, making it supremely portable and unlikely to falter in the event of a crash. 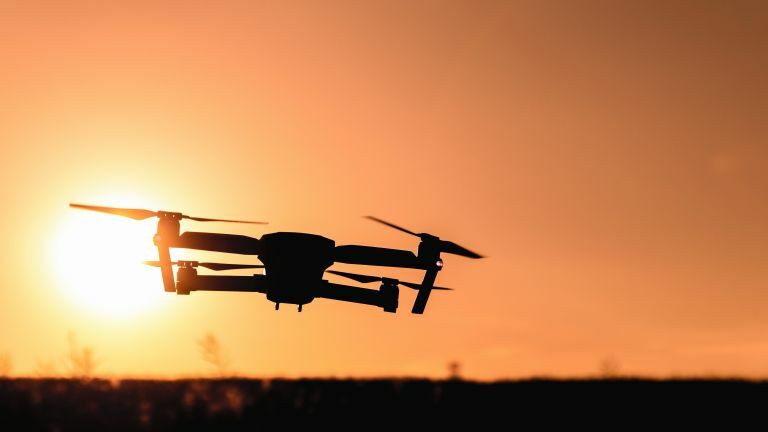 To make life easier on newbie pilots, only a single button push is required to bring the drone in to land, and a built-in positioning system keeps things stable in the air, improving control. The drone also boasts high and low speed modes so you can start off slow as you learn to master basic controls. Once you’ve earned your pilot’s wings, there are four fun 3D flip stunts to explore and cool LED lights for when you’re confident enough to try a night flight. Its title may be as long as the Star Wars opening credits but c’mon, it’s a real life Millennium Falcon! Your child will literally be the coolest kid on the block when this thing comes out to play. You can fly it up to 200 feet away and it can do an awesome stunt trick with a simple press of a button. The best bits are going to be the LED lights and sounds effects and it’s made from high density foam which means it’ll probably handle a few crash landings. With the only complaint being the short battery life (and that’s pretty much a given with drones anyway), we’re very certain that the Millenium Falcon will be a massive hit. Holy Stone make great drones for beginner pilots, and the HS177 is no exception. It boasts three speed modes to engage as your piloting skills develop and Attitude Hold means the drone will stay in the air if you take your hands off the controls. Once you’ve mastered solo flight, team up with another HS177 owner and you can engage in aerial combat; shoot your opponent with the drone’s infrared laser four times and they will plummet from the sky (don’t worry folks, in reality they land slowly and safely). This drone has a range of between 30 and 50 metres from the controller, so you have plenty of room to practice maneuvers, flight paths and explore the drone’s 360 degree stunt capabilities. Whether they choose to control it via their mobile, remote control or DJI goggles, this drone is a clever piece of kit that should really be reserved for an experienced flyer. There’s rules to be followed with this one, like you can only fly it below 120 metres. But it is pretty impressive when it comes to tech – automatic object recognition, understanding of simple hand gestures, UltraSmooth tech on the camera to reduce shake, wide angle lens, shoots 1080p HD footage… the list goes on. And so does the price… this one will set you back around £450. If space is an issue and your little one is only going to be flying indoors, look no further than Hubsan’s tiny, lightweight Q4 SE Nano drone. The quadcopter is stowed within the controller itself, making it one neat package. A 6-axis stabilization system keeps the pocket-sized flyer stable in the air and flip and roll maneuvers can be performed easily by pushing down on the controller’s throttle stick. Flight time may be limited to just three minutes, but the Nano Q4 SE charges in just 30 minutes so you’ll be ready to return to the skies quickly.